Juliano Mer Khamis was shot down in Jenin in the northern West Bank on April 4, 2011 at the age of 52. He was the son of Arna Mer-Khamis, a Jewish activist for the rights of Palestinians, and Sabida Khamis, an Arab Israeli, a Christian and one of the leaders of the communist party. In Juliano's own words, "I can't decide; I'm 100% Jewish and 100% Arab." Arna was the founder of the Theatre of Stones in Jenin during the first Intifada in the 80s. The theatre was destroyed by the Israelis in 2002, then rebuilt and named the Freedom Theatre. Juliano was murdered in front of it. He was born and grew up in Nazareth, Israel. After serving in an elite unit of Tzahal (the Israeli Army), he became an actor for television and film, notably in several films by Amos Gitai and international productions. 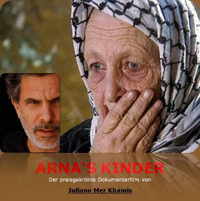 He produced and directed a documentary, Arna's Children in 2003. It chronicles the creation of a children's theatre company in Jenin in the 80s by his mother. Seven years after his mother's death, he returned to Jenin to interview these children, all grown-up, and found that some had become freedom fighters for the Palestinian cause, eventually killed by Israeli soldiers. 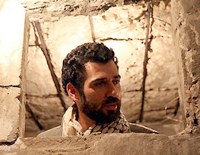 In 2006, thanks to an international fund raising campaign, he founded the community theatre for children and adults in Jenin, the Freedom Theatre. It was for him the continuation of his mother's work. Juliano was also a political activist in the Israeli-Palestinian conflict. He protested against the occupation of the West Bank and the implantation of Israeli settlements, and he fought for the rights of Palestinians living in the Occupied Territories. As an artist and activist, he knew that he was at risk; his theatre had been set on fire twice in recent years. All his life Juliano dreamed of building a bridge between Jews and Arabs, Israelis and Palestinians. With Juliano Mer-Khamis' death, a piece of that hope has been taken away from us.